Flash events, where prices rapidly change and revert to their previous levels, are not well understood. Government reports on these events are immensely helpful, and I was pleased to see a high level of detail in the recent Joint Staff Report on the October 15, 2014 flash event in US Treasuries. It’s hard to see by eye, but many of the charts in the report show important market metrics broken down by trader type, with what appears to be 1-2 second resolution. This kind of data is rarely made public, and is a huge treat for a practitioner like me. In this post I will begin to explore the contents of this ~15 minute dataset. The analysis required some moderately difficult image parsing, not an area of expertise for me, so there could be errors. 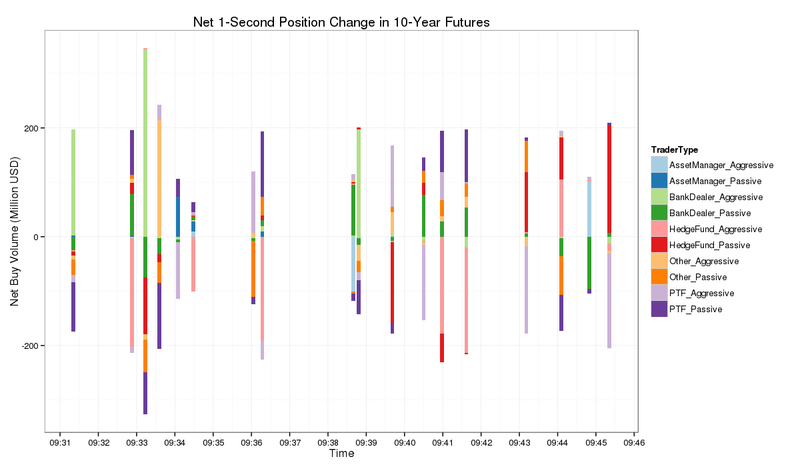 Net inventory change per second in 10-year futures. Data is from report Figures 3.6 and 3.8. Assumes that each bar in both figures represents 1-second. There are 928 such bars. 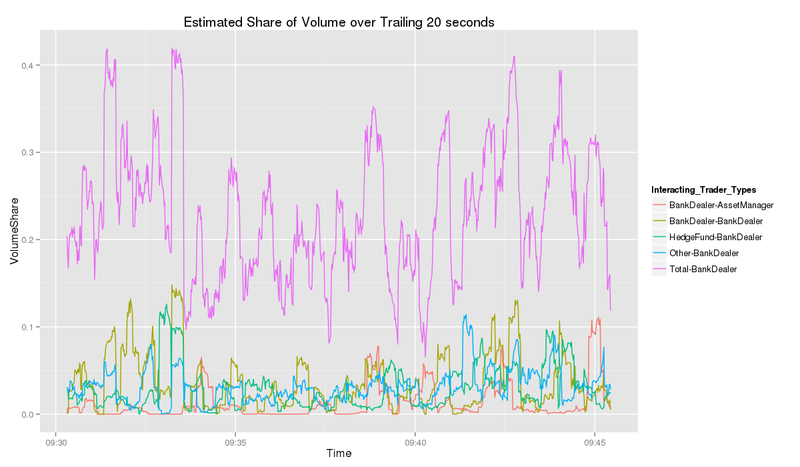 Assuming that the 1-second inventory change is reflective of actual trades , this figure shows that, during big seconds, little volume was generated by intra-group trading. Similar to above, from Figures 3.5 and 3.7. Estimated portion of 10-year futures volume during the event window attributable to each pair of groups. For example, 2% of volume was from asset managers trading with PTFs. 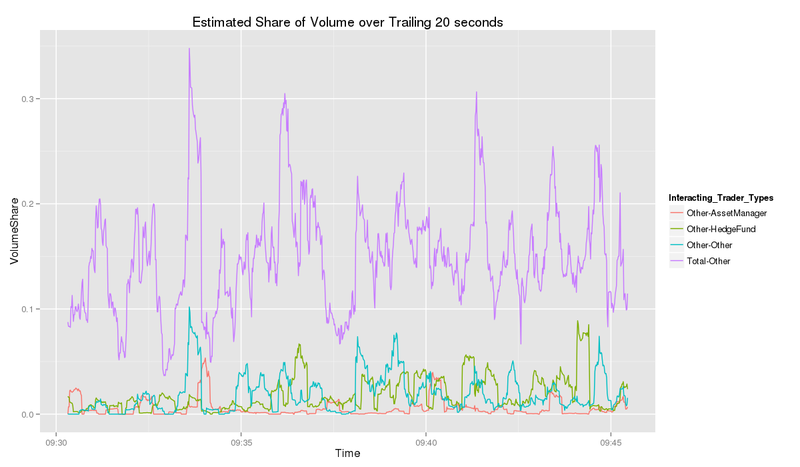 Net inventory change per second is used as a surrogate for volume. Counterparty-tagging is estimated pro-rata, e.g. if PTFs and banks each passively bought 50 in 1 second, when hedge funds and asset managers each aggressively sold 50, then the estimate is that hedge funds sold 25 to PTFs and 25 to banks (and asset managers did the same). Again, data is from figures 3.6 and 3.8. Volume is single counted. 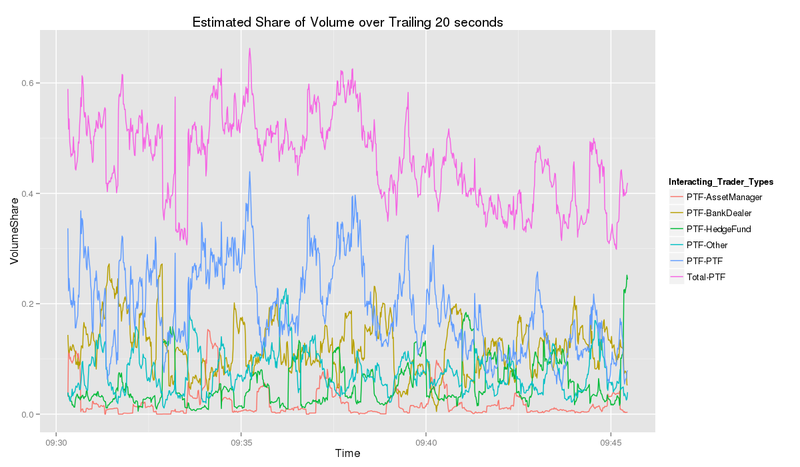 Estimated portion of total volume in the preceding 20 seconds traded between PTFs and other groups for 10-year futures. The estimated volume share of PTF-PTF is rarely far from the square of total PTF share, which suggests that worries about “PTFs trading almost solely with each other” may be unfounded. Plots for the other group-pairs here, here, and here. Estimated portion of 10-year futures volume between passive and aggressive trades from each group. Around 9:39 ET, the sudden visibility of certain sell limit orders in the futures market seemed to have coincided with the reversal in prices… [W]ith prices still moving higher, a number of previously posted large sell orders suddenly became visible in the order book above the current 30-year futures price (as well as in smaller size in 10-year futures). 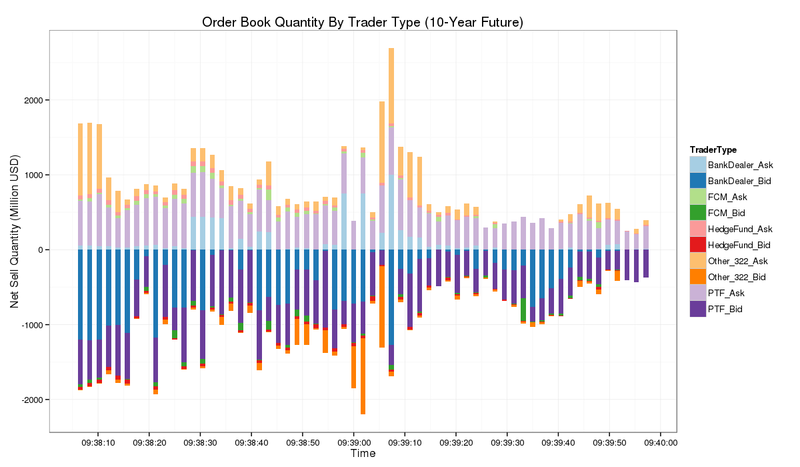 Estimated visible book depth in top 3 price levels for 10-year futures, by type of trader. Hedge Fund and FCM data from 3.22 is merged into data from Figure 3.19. The depth quantity from the “Other” trader category in Figure 3.19 appears to be very close to the sum of the quantity from “FCM” and “Other” traders in Figure 3.22; “Other_322” uses the Figure 3.22 data. Aligning, renormalizing, and merging the data from Figure 3.22 into data from Figure 3.19 required some judgment, so there may be errors (and the x-axis is probably off by a few seconds). 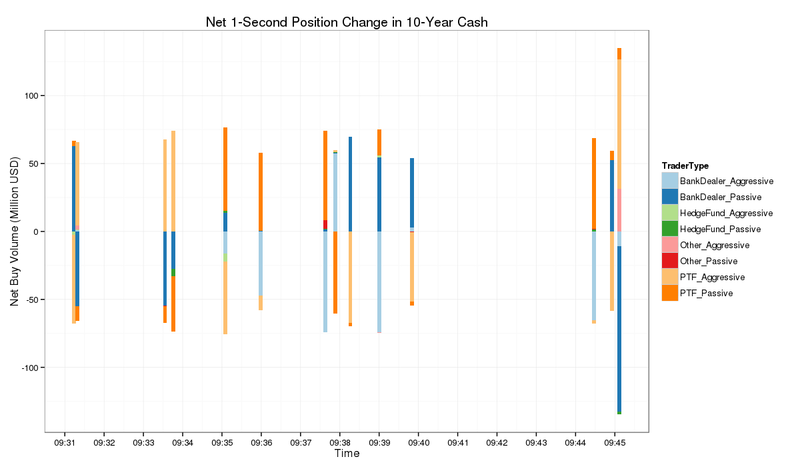 Time resolution of the data in Figure 3.19 appears to be about 1.8 seconds, but the similar Figure 3.17 from the cash market has an apparent resolution of 1 second; it’s possible that this disparity is because the authors wanted to protect traders’ privacy. The origin of these large sell orders could have been traders in the “Other” category of Figure 3.22. I wonder if they may have come from asset managers, which are not separately included in the depth plots. According to the report: “in the 5-year note in the cash market… self-trading accounted for about one-third of net aggressive trade volume between 9:33-9:39 ET.” Levels of self-trading were high on futures markets as well. Regulators are contemplating new, industry-initiated, rules on self-trading. That makes a lot of sense. The usual defense of self-trading argues (correctly) that it can be the accidental by-product of compliant trading, hardly a claim that self-trading is beneficial. [T]here are three qualities of liquidity that really make up the definition. A security is liquid if it can be traded quickly, if it can be traded in large size and if it can be traded without moving prices. I think that our markets tend to have a layer of liquidity provided by professional intermediaries, and a much thicker layer provided by slower latent traders, far from the top of book. In rare occasions that intermediary layer could be exhausted and, if sufficient time isn’t available for latent traders to step in, a flash event may occur. If so, I’m not sure that there’s an easy remedy. Some people may think that slowing down our markets would prevent these flash events, but I suspect it wouldn’t be that straightforward. Latent traders might check prices once a day (or less), which would mean that our markets would need to be made *a lot* slower. Also, some latent traders may pay attention to the market only after significant volume has transacted at their target price, so slower markets could still have episodes of extreme volatility, they’d just last for days instead of minutes. Some flash events probably have more rectifiable causes. The August 24, 2015 event was likely exacerbated by temporary changes in market structure from LULD halts, NYSE Rule 48, futures being limit-down, and futures’ price limits changing simultaneously with the equity opening. These measures are intended to give markets time to attract latent liquidity. But because they alter market structure, they may shutdown some professional intermediaries, which aren’t set up to trade in one-off conditions. Increased volatility isn’t surprising with intermediary liquidity missing, and still insufficient time for most latent traders to become active. I’ve argued in the past that more post-trade disclosure would dispel conspiracy theories and ensure that our markets stay clean. This Joint Staff Report included data with a resolution that surprised me. I hope that trend continues. Even if it doesn’t, there is a possibility that data with this level of precision can be matched with real market data messages to a limited extent. That isn’t an easy problem technically, but I intend to give it a try. IEX says that in July 17.7% of trading on its platform is done by proprietary trading firms, which it says are firms that have no clients and trade for their own account. It places HFT firms in this category. Brokers trading their own principal—they include both HFT firms and the big banks’ proprietary trading desks—account for 23 percent of IEX’s trades. Though this second definition may be different than the one given in 2014, since it includes banks’ supposedly shrinking prop-trading desks and also appears to be restricted to broker-dealers. The Joint Staff Report’s definition says that PTFs “may be registered as broker-dealer[s]” (emphasis added), and certainly not all high-speed traders are broker-dealers. Categorizing the firms requires some judgment, particularly given that they sometimes share certain characteristics or may act in multiple capacities… [S]ome bank-dealer and hedge fund trading patterns exhibit characteristics of PTFs, while many smaller PTFs clearly are not trading rapidly. This should be close, but not identical, to the aggressive and passive volume of each group. For example, Bank A may aggressively buy from PTF B, then Bank A may aggressively sell to PTF B. If these trades occur in the same second, there would be no net change in Bank-Dealers’ aggressively accumulated inventory, or PTFs’ passively accumulated inventory. This 15-minute period is exceptional, and I couldn’t say how often that kind of trading occurs even normally, but we have a hint from a nice paper by CFTC staffers Haynes and Roberts. In that paper, Table 8 provides a measure of holding times for different types of traders. It shows that, for the 10-year bond future, 42% of the volume executed by large, automated traders is typically netted with trades on the opposing side within 1 minute. We can crudely estimate the portion of these traders’ volume that is held for under a second by considering the distribution of order resting times, given in Table 7. Summing the appropriate values for the 10-year, about 8.6% of double-counted volume is generated by passive, automated orders that are executed within 1 second, and 23.5% within 1 minute. The ratio of these two numbers is 37%, which may also be reflective of the ratio between trades that have a 1 second holding time (or less) and trades that have a 1 minute holding time (or less). 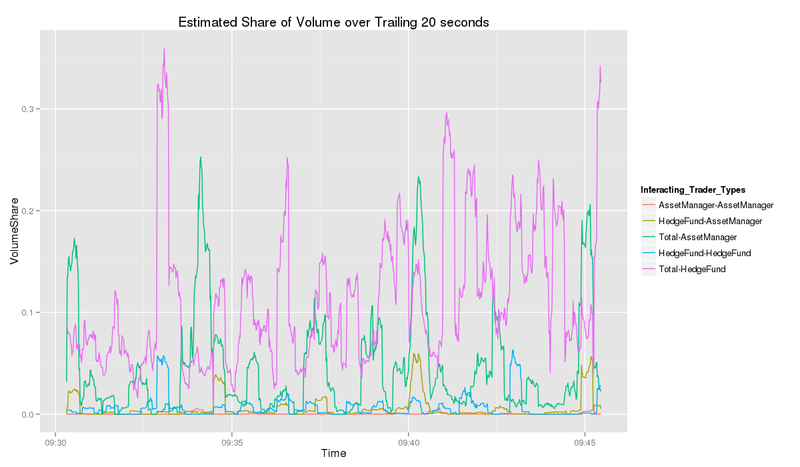 So we can (very roughly) estimate that 0.37 * 0.42 ~ 15% of a typical high-speed trader’s volume is turned over in a second. This estimate applies to single traders’ turnover, not the aggregate of their group. With a 50 million dollar threshold instead of the 100 used for the futures plot, because the cash market is less active than futures. One of the first things discussed on this blog is that algorithms generally want to avoid trading with one another. Table 4 from the above-linked paper says that total volume for 10-year futures is typically composed of: 43% algorithms trading with algorithms, 41% algorithms trading with humans, 12% humans trading with humans. These statistics show algorithms interacting with other algorithms about as often as you’d expect by random chance, which surprises me slightly — I’d have expected algos to tend towards interacting more with humans. Correlation between trader groups’ 1-second (aggressor-flagged) inventory changes. Data again from Figures 3.6 and 3.8. A large positive (negative) number means that the two groups are more likely to be trading on the same (opposite) side during the same second. Nothing immediately struck me about the lagged cross-correlations or auto-correlations; except perhaps that asset managers tend to persistently trade on the same side, which I think we already knew. Sub-second, group-wide turnover, when it is make-make or take-take (sub-second turnover for individual HFTs was estimated to be roughly 15% in ). Sub-second turnover should appear in the charts if it’s make-take or take-make, because net inventory in the charts is split by aggressor flag. The y-axis resolution of the charts. The smallest visible changes in net inventory are $2.4M for the aggressive chart and $1.9M for the passive chart. So small executions may be under-represented. Algorithms are known for sending smaller orders than humans. Self-trades could conceivably have been excluded from these charts. Data omitted from the charts. An error on my part. The total volumes in the aggressive and passive charts differ by about 15%. That may give an idea of the margin of error. For specific seconds, the estimated level of intra-group trading is higher. As the time resolution increases, intra-group share should become more volatile (at the finest resolution, it will frequently spike to 100%, whenever a single intra-group match occurs). If you’re interested, here’s a table of seconds when more than $30M traded and the intra-group share was above 75% (estimated). This will happen by random chance most often for the largest trader group (PTFs). I won’t pretend that there’s a way to test statistical significance without control data, but there is possibly a cluster of PTF-PTF trading around 9:33:40 (the timestamps could be off by a couple seconds). It could also create awkwardness in the company cafeteria. If one group has been making money off of another, that might become obvious if self-match prevention were enabled. Manipuative self-trading imposes a much higher cost on market participants, because the “noise” is specifically designed to deceive. Though, some people think that noise in market data can reduce “front-running” and is beneficial. I don’t agree. If you think transaction costs would be lower with more limited data, paring data feeds makes more sense than corrupting them. I also suspect that, for most markets, realtime order and trade transparency lowers costs. This is just speculation, but I wouldn’t be surprised if most non-manipulative self-trading in these markets is from just one or two firms. A rumored (and disputed) report on BrokerTec shows that two firms execute 40% of volume there, Jump and Citadel. Citadel also has a reputation for internal secrecy. It’s easy to see how liquidity anxiety would affect asset prices negatively, especially for flight-to-safety products, which are considered “safe” partly because of their liquidity. Say, hypothetically, that money markets are 100% liquid today, but you suspect that they could freeze up in the next year. You’d probably empty your account immediately, right? If enough people did the same, then liquidity could evaporate in a run. Less intuitive is the possibility that the very safest assets could increase in value when liquidity is expected to disappear. In such situations, there are probably even worse fears about other markets. Long-term treasury prices actually went up during the 2011 debt ceiling crisis, despite some pessimistic speculation. If this phenomenon contributed to the treasury flash rally, there would presumably have been changes in other assets’ liquidity measures, cross-asset lead-lag relationships, or correlation structure. A consequence of this model is that the order book will be skewed in the opposite direction of a meta-order, e.g. as someone buys a large block of AAPL, there will usually be more quantity available on AAPL’s offer than its bid (near the top of book). That could be an important detail in the “front-running”/HFT/spoofing debate, because the traders who use skewed order books to predict price may actually be trading on the other side of large meta-orders — offering fundamental traders cheaper fills, rather than pushing the price away from them. Strategies that use order book signals may still compete with other mean-reversion traders, but complaints about that don’t sound very compelling. After buying 3,000 contracts in a falling market in the first ten minutes of the Flash Crash, some High Frequency Traders began to aggressively hit the bids in the limit order book. Especially in the last minute of the down phase, many of the contracts sold by High Frequency Traders looking to aggressively reduce inventories were executed against other High Frequency Traders, generating a “hot potato” effect and a rapid spike in trading volume. I don’t know what sort of analysis the authors did to determine whether a given order increased or decreased a trader’s exposure. It seems likely that they considered a trader’s “position” to be a combination of their 10-year cash and futures holdings. That wouldn’t be the only measure of market exposure. For example a trader that is short the 30-year may consider buying the 10-year to be a partial hedge. Likewise for a trader long stocks, or another correlated basket. With the exception of Bank-Dealers, which aggressively covered short futures positions to the tune of about $200M across 3 minutes, a number that does not sound particularly high. This entry was posted in Uncategorized on September 28, 2015 by Kipp Rogers.